I crossed into Malaysia yesterday to do some shopping for my new Singapore apartment (prices are noticeably cheaper for things in Malaysia as they are in Singapore). I have done this border crossing twice before, but never since I have moved to Singapore for work. From my new apartment, it takes about 45 minutes to the border, and with all the transfers between bus and train, only costs about $1.60USD. It's also nice to see they don't have a 'border premium' as they do when alighting at Lo Wu station in Hong Kong. I had originally been waiting to do my cross border shopping for when my girlfriend arrives from Seoul, but when I saw that McDonald's was offering a limited time 'Corn Flake McFlurry' I had to make the trip earlier than planned. I scoped out a McDonald's in the City Square Mall, that was actually connected to the immigration office (and where I would catch a bus back to Singapore). After doing my shopping and having dinner, I stopped at this branch to get my McFlurry. As is common in South East Asia, they had a dessert specific ordering queue. It was about 12 person deep, and took roughly 15 minutes before I could get my ice cream. 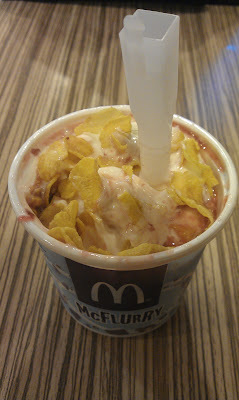 The man taking the order spoke English pretty well, when I asked for a Strawberry Corn Flake McFlurry, and though he originally said they were out of Strawberry, but he double checked and confirmed they had enough for one more, lucky me. 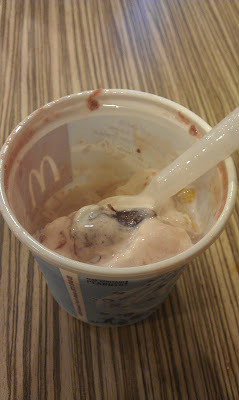 McDonald's were offering both Strawberry and Chocolate versions of a Corn Flake McFlurry, as well as a Corn Flake Sundae. I thought strawberry would be a more unique variant as many McFlurries already incorporate chocolate, and not that many use strawberry. 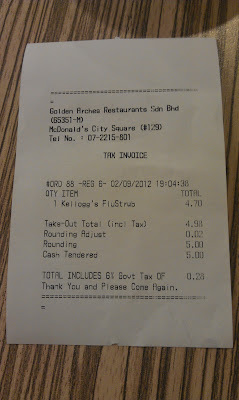 They were being marketed as 4.70RM, but VAT was not included in the posted price, so it came up to an even 5RM, which was one of the cheaper McFlurries I've had in recent memory. The Horlicks McFlurry was available, which is still on promotion here in Singapore (and which I already reviewed here), as well as the standard Oreo, and a both a Chocolate or Strawberry Cornetto McFlurry, which in Asia, is unique to Malaysia. The cup was the a standard plastic McFlurry cup without any promotional packaging. Almost at the bottom, and still finding strawberries! I'm not sure who's idea it was to top a McFlurry with corn flakes (why not Frosties?). The corn flakes didn't add anything special, and the ice cream and strawberry flavour over powered them, so all it did was add a bit of crunch to the ice cream. Though, I did enjoy the strawberry syrup. 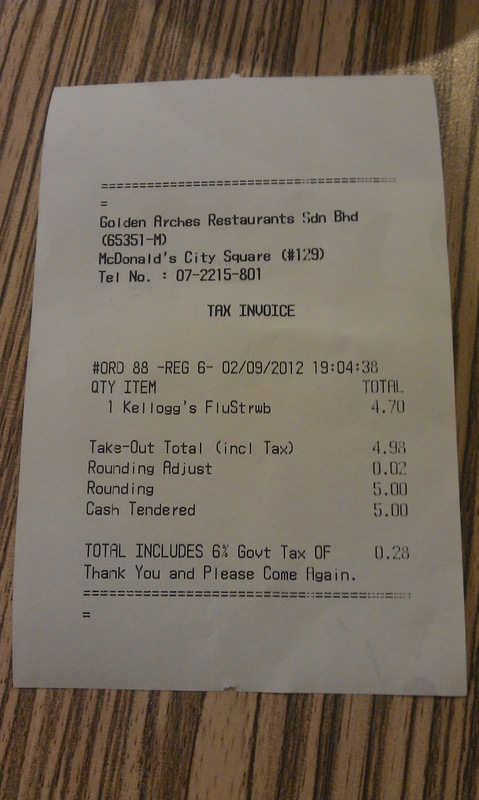 Maybe I'll give the Strawberry Cornetto McFlurry a try next time I cross.